The Archer House is the oldest hotel in Northfield today, but it was not the first one built here. Earlier hotels had been wood-frame structures that were more like rooming houses. 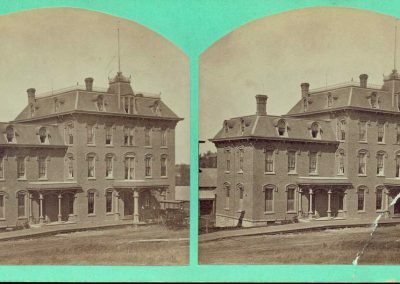 In 1877, James Archer, an innkeeper from Hastings, Minnesota, recognized an opportunity to establish a more elegant hotel in Northfield. When his “Archer House” opened in August of that year, the local paper described the event as “an episode of grandest proportions in Northfield’s history.” Guests included prominent businessmen, government officials, and wealthy families from Faribault and the Twin Cities. The Archer House was one of the earliest brick commercial buildings on Division Street. It sported a mansard roof and arched dormer windows on the fourth floor—details characteristic of the French Second Empire style. The hotel, which cost Archer $13,000 to build, had fifty rooms, as well as a telegraph office on the first floor, and a ladies parlor on the second floor. Archer sold the hotel the following year to A. W. Dampier, owner and manager of the Dampier Hotel on Bridge Square. Minnesota, gave the Archer House to his daughter Elizabeth and son-in-law Homer Roberts in 1894. They installed telephones and built the north wing, with a first floor dining hall. In 1900, they installed electric lights. Over the next few years the hotel changed owners and names several more times. Known as The Manawa for a while, it became Boll’s Hotel in 1911. The following year, owner Fred Boll sold it to G.R. Stuart and it became the Stuart Hotel, a name it carried until 1981. The clientele of the Stuart consisted of business people, students, and other visitors to Northfield. They traveled to Northfield by train and were picked up at the station by a horse-drawn coach. The hotel changed ownership eight times between 1929 and 1981. By the 1970s, the Stuart was known primarily as a place to catch Jefferson Line buses. Its rundown rooms were small and not air-conditioned. In 1981, Northfield building contractor Dallas Haas purchased the Stuart. He restored the Archer House name and restored much of its nineteenth-century charms, while installing modern amenities. He also revitalized adjacent commercial spaces. The current owners of the Archer House River Inn have continued Hass’ legacy. In 2011, they completed an extensive renovation, with the goal of extending the hotel’s service far into the twenty-first century. An early image of the Archer House before the north addition was added.